With our good friend Serena over from the Emerald Isle for the weekend, we have been having fun.. So a breakfast after a jaunt through the countryside was well in order! Arriving at the town of Bedford. With one porpoise in mind.. Brilliant breakfast at THE best samosa chaat store I have ever had the pleasure of eating at.. Ok it’s an in and out job as I have mentioned before.. Out before the pimps , junkies and dealers begin their new day! 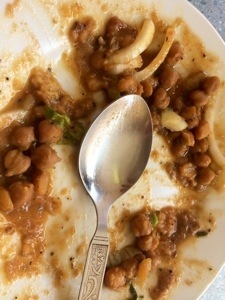 Yet this food is stunning.. It’s the only time we eat chick peas.. It don’t look the greatest yet I have no idea how they make this taste so flipping fantastic! The flavours just l come together with a whack of heat that clears you sinuses and wakes you right up! 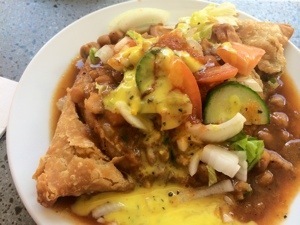 Simple delicious samosas.. With sauces of a mystery .. Chick peas chole style and salad.. It just works.. And works so well!! Breakfast at Balas.. 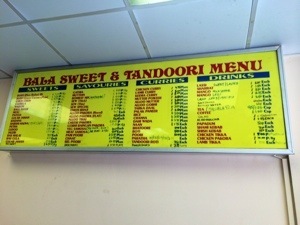 It has a ring to it.. Maybe a Bollywood movie… Hmmmmm .. 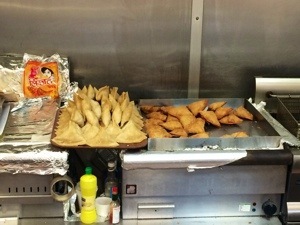 Tags: a little bit hot!, bala sweet store, bedford, food, the best samosas in the world, vegetarian breakfasts, where to eat in bedford?